I happened upon a group on Flickr called The Tag Tree Project which is a way of sharing 'art' with others. The group is run by 'My Dog Sighs' and if you're wondering about the name a full explanation is given in his Flickr profile. 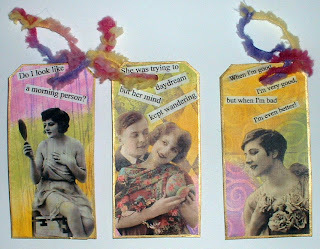 The idea behind the project is for people to decorate tags however they like, with whatever medium they chose and to any size and theme. The tags are then sent to My Dog Sighs with a stamped SAE. He then returns you a tag to keep (or tags depending on how many you send to him) from someone else. All the tags he keeps will be and in his own words "hung as a collaborative art installation" on a specially sculpted metal tree and exhibited in the Summer of 2009 in Southsea, Hampshire, UK. The work will be documented by local photographers and press. The idea is that members of the public can go along to admire the tree and then take home with them a tag they like. The project seems to have caught the imagination of many people as the Flickr group has 237 members at the moment and new members are welcomed all the time. So, here are my tags for the tree. I used some large tags (60mm x 120mm) and backed with card to make them stronger. 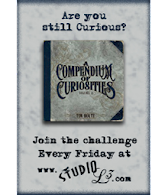 The backgrounds were inked with three colours and rubber stamped and then vintage images and text were collaged on. (The backs were inked with one of the colours and rubber stamped over). Some fibres were added for the hanging. I forgot about the hanging when applying the text (Doh!) 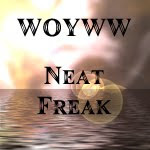 so it needs to be moved over a bit to see what the text reads. I hope the project is a big success and the tree will look stunning covered with all the tags I'm sure. 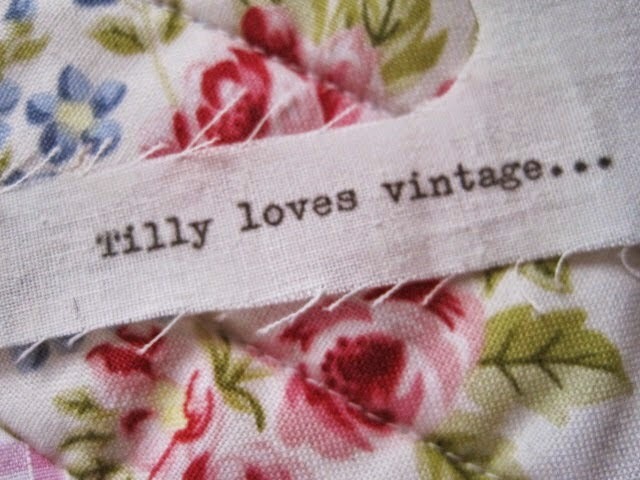 This one is on it's way to Renee (Nayski on Flickr) for a one to one trade. 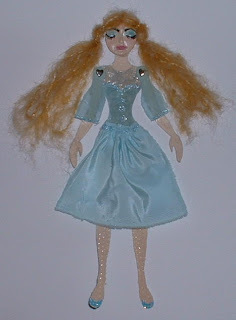 You'd never have guessed but I just love making these little dolls (as I think I've mentioned before - lol). If anyone out there would like to trade one I'd be only too happy to make some more. 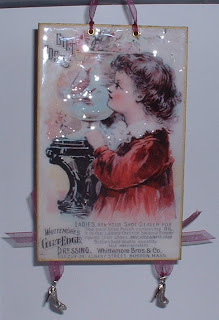 I made this following a brilliant tutorial by Ange (AKA Agnes The Red) Altered Art Project which was to alter an ATC incorporating a window shrine. This sounded complicated but was actually very easy to do. More details may be also be found on Ange's SIS Flickr group. As Ange's tutorial is very comprehensive I won't go into great detail on the construction here, but will say how I decorated it. I covered the whole thing in tissue paper (glued it on with PVA). Once dry I used acrylic paint dabbers in gold and silver all over. Inside the recess I smeared some Platinum Stickles (from Ranger). 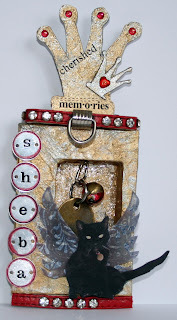 I used some lettering on small silver discs for Sheba's name and part of her collar as the red edging at the top and bottom of the ATC. The crown at the top is cut from Grungeboard and onto it is stuck a small acrylic crown. This was originally going to be pasted onto Sheba's head, but it would have obscured her little ears! I printed off a picture of Sheba and added some wings (with a touch of sparkle). Into the recess I hung her name tag and little red bell so they will always be safe. 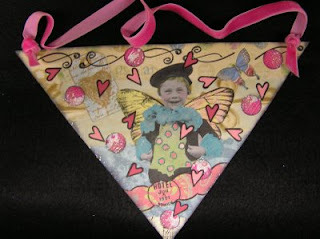 Over on her blog Honey Girl Studio, Melissa is giving away this beautiful valentine pennant she has made. 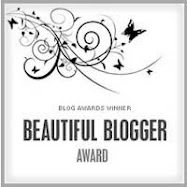 All you need to do is leave her a comment on her blog and she'll put you in the draw. 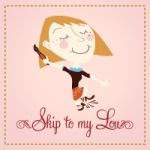 She has some amazing creations on her blog and it's well worth a visit. 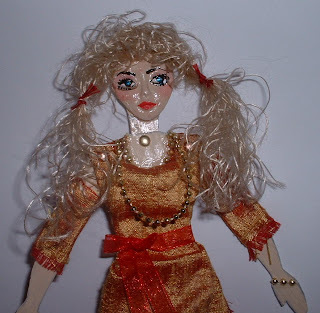 Here's the doll I made for Margaret who is 21 again today! I made this one a bit more special than the others as Margaret is one special lady. Happy Birthday MAMMA! 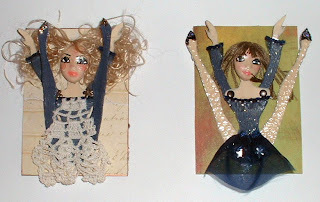 More paper dolls but this time on a much smaller scale so they could fit onto (and close up to fit onto) an ATC. Now I know the receipient has received them I'm safe to picture them - I did them in a bit of a rush so cheated with the backgrounds and just opted for some lovely printed papers. Wish I was as flexible as that! 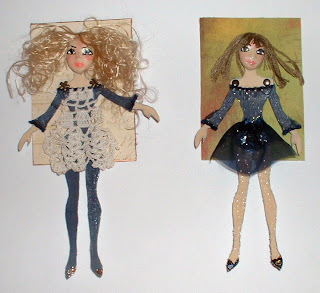 These little paper dolls can become quite addictive - I think they bring the little girl out in me - I just love to dress them, make up their faces and give them beautiful hair! One day I'll grow up I suppose! I find the easiest way to dress them is to stick on (with Anita's 3-D Clear Gloss Finish) some sheer type fabric and then add embellishments once it's dried. For the hair I've used some embroidery thread and some fluffy wool. 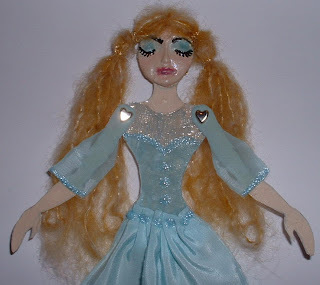 It's funny how mistakes can sometimes turn out for the best - as was the case for the slim dark blue doll here. Once I'd made up her face I sprayed some 'Porcelain Gloss' over it to protect it but the ink on the lips reacted with the spray and became all smudged. 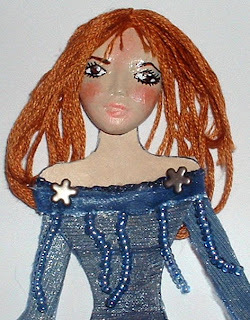 I immediately wiped the bottom half of the face with a tissue and it left a pale covering of colour on the lips which suited the hair colour better than the dark red I had used in the first place! I also like using netting for the legs (again stuck on with the Anita's product) as this makes the doll look as though they are wearing glossy tights or stockings! 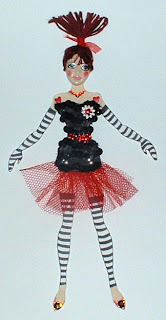 There really are some amazing dolls over on the new MAD (monthly art dolls) MAMMA site which are well worth a look. 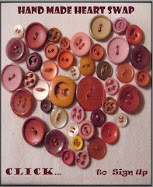 Margaret has created another spin off Flickr site called LOL MAMMA Valentine Swap (LOL for 'Lots of Love') She has provided a link for a heart template to download and decorate. 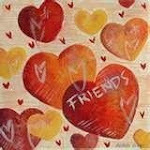 All of the hearts entered will be swapped by random generator on 5 February. For my heart I printed off the template onto card then covered it with 'Plaster Cloth' This is quite messy to use and takes a while to dry but you can create a lot of texture with it and it's fun too. Once it had finally dried, I painted over the whole lot with some acrylic paint in two shades of pink. I wrapped some small pearl beads around the heart then embellished it further with some paper flowers, more pearls and some little gems. 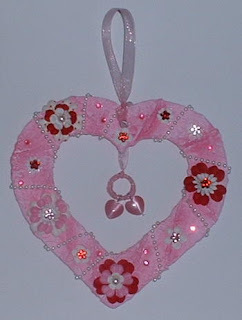 I attached a ribbon hanger and suspended two little pink hearts from the centre which are hanging on a jump ring covered with more of the ribbon. Whilst making this I was reminded of a little pink plaque I bought from Ebay a while ago which says "What makes you think I like pink" - very apt for this I think!!! 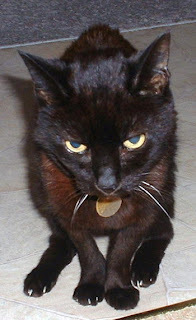 It was a very sad day for us yesterday when our lovely cat Sheba paid her final visit to the Vet. She had been on medication and special dietary food for several years and lived to the good cat age of nineteen and a half. She has been a faithful friend and companion to us and will be missed very much. The picture above was taken about a month ago and she was quite small then, but had lost even more weight in her final weeks. She is at rest now and leaves us with many happy memories. MAMMA's first theme of the new year is 'Man/Men' which she says "In honour of John, who has to put up with soooo much from all us ladies" John being the only man in the group has to put up with a lot of stick from some of the ..... 'ladies'.... in the group - lol. He is a very good sport though and it has to be said sometimes even encourages us!!!! 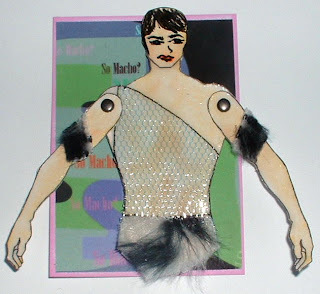 My ATC for the swap is called 'So Macho?' 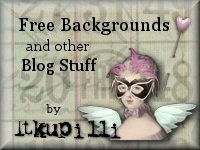 The background was made using the TypoGenrator site. For the man I've used the top half of another ATC doll pattern (he is legless - haha!!) I coloured his torso and arms with some pastels and he even has a bit of a six pack (although I'm not sure it shows up much in the photo) He is sporting a very fetching off the shoulder net vest and some fun fur underpants and matching arm bands). Is he macho? Well, I'll let you decide. As for John, well having never met him in person, I really wouldn't like to comment!!! The very lovely and talented Margaret has finally officially declared herself as MAD! Only kidding of course - MAD stands for 'Monthly Art Dolls' and is Margaret's very exciting new public Flickr group called MAD MAMMA. 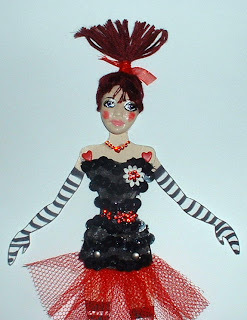 Each month Mad Mamma - oops I mean Margaret will set a new challenge to make an art doll. 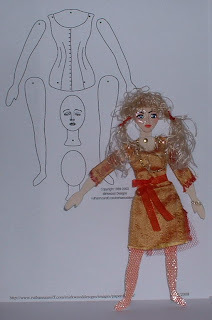 For the first month - January the challenge is to make a 'Jointed Card Doll' using the template by Mirkwood Designs. I used an air dried clay moulded head painted with acrylics and features made up with Sakura pens and chalk. The hair is from an old cone of very fine fibre (I don't know what it is exactly - some kind of cotton I think). Her stocking are made from some netting which I've attached to the legs with Anita's 3-D Gloss Finish. There is also more of the netting under the dress. The dress is made from a scrap of beautiful fabric. The sleeves don't go right up to the shoulders as I thought it may create a problem with the brads. 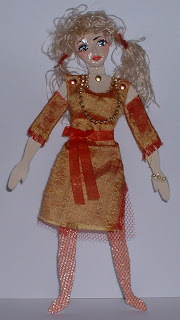 She is wearing some gold beads and a matching bracelet. Oh, and she also has a bust - made with some wadding! I'm pleased with how she's turned out and hope that she'll go to a good home - once Margaret make the draw at the end of the month. Can't wait to see what kind of a doll next month's challeng will be now! This month's theme for the UK Art Raffle is 'Shiny' and Sarah who runs this raffle said this theme is 'inspired by everything new and glossy and sparkly, in honour of the brand new year'. She also said that we can interpret the theme in any way so although it's about everything new, I've actually gone back in time and used an image of a vintage poster for shoe polish! What could be more shiny than freshly polished shoes? 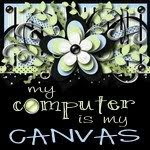 With the image I've made a little wall hanging measuring approx 4" wide by 6 1/2" long. To make it shine I've used some clear UTEE. It's funny how this technique is often called 'triple embossing' whereas in reality we use more like eight layers of embossing - so what would that be called 'octagonal embossing' - lol! Anyway, it gives a wonderful glass like shine. To finish the little hanging I've attached a couple of shoe charms at the bottom and used a co-ordinating ribbon with the little girl's dress in the poster. .... and don't forget, you've got to be in it, to win it! .... and now I can't get Take That's song 'Let It Shine' out of my mind - lol!! !